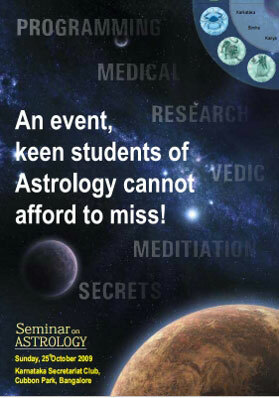 Avid students of Indian astrology are in for a treat. The brightest stars in the domain, Dr. T.S. Vasan, Dr. Krishna Kumar, and Mr. S.N. Tekur will share their knowledge at a one-of-its-kind intensive session. The event offers excellent insights, touching upon the diverse approaches and finer aspects of the subject. Dr. T. S. Vasan is a research scholar in Vedic Astrology for several decades. A highly revered professional, he has authored several books on astrology and palmistry, compiled courses and initiated study circles in these subjects. He is the national Vice President of Indian Council of Astrological Sciences (ICAS) founded by Dr. B. V. Raman and the Director of Studies, ICAS, Bangalore Chapter I. Dr. Vasan holds degrees in Science and Law and diplomas in Yoga, Homeopathy & Comparative Religion. He has a Doctorate from the East-West University, Missouri, USA and is a Fellow of Royal Asiatic Society, London. He is the recipient of several prestigious awards and titles like Professor Emeritus, Jyothir Vidyalankar, and Jyothisha Sarva Bhouma. He has presented papers in various national and international conferences. Dr. Vasan presents some of the valuable contributions and research done by other scholars of this country. Dr. Vasan will elaborate on topics related to Panchanga, Nakshatras, Stellar-Progression, Bhrigu-Bindu, th 64 Navamsa, Puskara Navamsa, Nadi Principles, Uccha-Neecha Stanas, Moola Trikonas, Kendra Trikonas, Dispositor Yogas, Yogi-Avayogi, Mruthyu Bhagas, Amrutha and Vishagatis, Chandrodaya, etc. Dr. S. Krishna Kumar is a renowned scholar of Vedic Astrology and a teacher of the subject for over three decades in India and abroad. He has deep knowledge of Vedanta, is an author of several books and a recipient of various awards and titles. An engineer by qualification, Dr. Krishna Kumar is one of Bangalore's leading industrialists and Member, Managing Council, KASSIA. Dr. Krishna Kumar talks about the astrological influences on human health - analysis of diseases, surgical indications, curable and incurable diseases, conventional and non-conventional remedies, identification of diseases and possible cures of both physical and psychosomatic ailments. Mr. Shirdi Nath Tekur's interest in Vedic Astrology was sparked off by studying Dr. B. V. Raman's books in the eighties. With a Jyotish Visharada from ICAS, Mr. Tekur joined the Bangalore Chapter as a faculty and is respected for his deep knowledge of the subject. He has conducted classes, career guidance camps, and organized several lectures including a one- day workshop on Shadbala Applications under the auspices of Raman & Rajeswari Research Foundation. Mr. Tekur has delivered talks at various seminars and conferences and has been awarded many titles in recognition of his services for the cause of astrology. He is a frequent contributor to The Astrological eMagazine. Mr. Tekur served HAL as an aeronautical engineer and is currently a senior consultant for Tata Consultancy Services, Bangalore. Mr. Tekur will share his insights on developing analytical skills and suitable counselling by blending powerful tools and techniques such as Neuro Linguistic Programming (NLP) and Vedantic Meditiation to provide genuine and lasting relief to people. Download the delegate registration form. Delegate fee - Rs. 200.00 only. All registered delegates will get a Participation Certificate from Raman & Rajeswari Research Foundation, Regd. Display your banner or put up a kisok during the event and reach out to the astrological world. Write to info@rrrf.in or call us at 080-65991845 for booking. Copyright (c) Raman & Rajeswari Research Foundation. All rights reserved.